Before checking cable connections, make sure that you have connected the power adapter of the switch to its power port located on the back panel and that it is plugged in to a power outlet. NOTE: The switch models SE1500, SE2500, SE2800 and SE4008 have a LED button that turns the device ON or OFF. The switch will still work even if the LEDs are switched OFF. To check if the cable is working or not, try connecting the cable from one (1) port on the switch to another and check if the corresponding LED port status indicators lit up. Otherwise, use another cable to isolate the issue. Make sure that the cable is tightly inserted when connecting to any of the Ethernet ports on the switch. QUICK TIP: If you do not have an extra Ethernet cable, you may purchase from a local electronic shop. Some of the previous models of switches don’t have the capability to automatically detect the type of cable being used; whether crossover or straight-through. If you have this type of switch, a straight-through Ethernet cable is used to connect a computer to a switch or a router to a switch. For switch to switch connections, a crossover cable is used. NOTE: The numbered ports on the Linksys SE1500, SE2500 and SE2800 switches have auto MDI/MDI-X (straight-through or crossover) cable detection capabilities. This means that you can use any type of cable and it will automatically be detected. 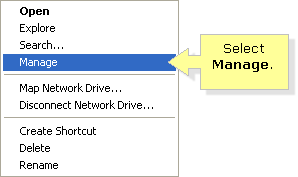 Access your computer’s device manager by right-clicking the My Computer icon on your Desktop and then select Manage. 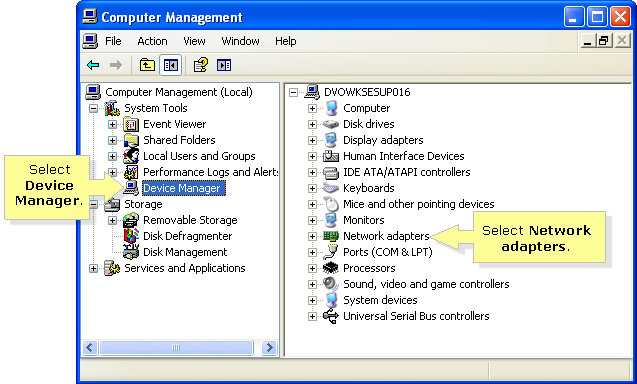 Select Device Manager and on the right pane, select Network adapters. Under Network adapters, you will see the Ethernet adapters installed on your computer. Right-click on a particular adapter and select Properties. NOTE: You will see from this window the status of your network adapter if it is working properly or not. For Ethernet adapter driver problems, refer to the adapter manual or contact the manufacturer’s product support. The LED lights on the ports may not be functioning. However, this does not mean that the switch port itself is defective. When you’ve checked all the possible reasons why the LED indicators do not light up, and the problem still persists, your device may be defective. For help regarding this issue, you may visit the Linksys Support Site.